I am always trying to make foreign language activities that are more communicative and give students opportunities to use the target language authentically. I do firmly believe that accuracy has a place in language production and I do not focus only on fluency tasks, but even when practicing accuracy I try to have a communicative component. 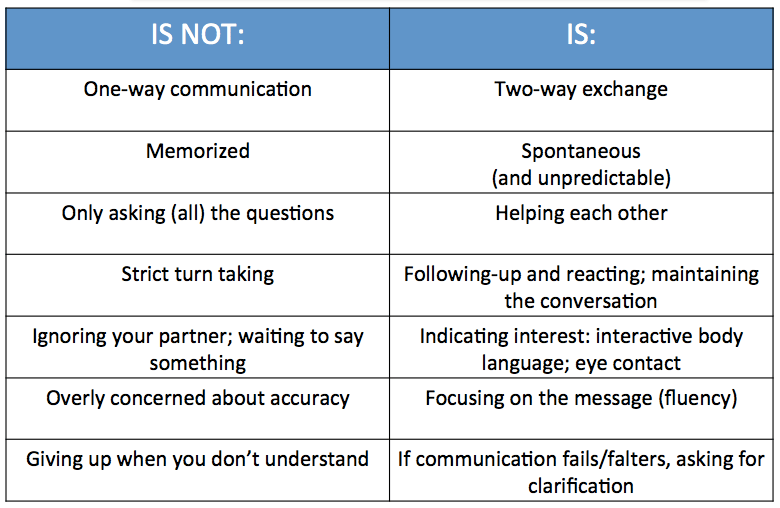 To ensure this, I keep in mind the table below that reminds me what interpersonal communication is and is not. This entry was posted in Classroom Procedures, Teaching Methodology and Research. Bookmark the permalink. I would like to know the references of this information. Thanks a lot. Brown, Gillian and George Yule 1983. Teaching the Spoken Language. Cambridge: Cambridge University Press. Burns, Anne 1998. Teaching Speaking. Annual Review of Applied Linguistics 18, 102-123.